WNED | WBFO is a joint licensee operating three television stations and three radio stations. We envision our website as the digital hub for all of our services. And we were looking for CMS that could help us effectively accomplish that. Previously, we worked with a developer to custom build wned.org using the Joomla platform, but there wasn’t a budget to continually outsource major design changes to keep pace with our digital needs. The timing of Bento 3.0 was perfect. To better serve our organizations digital goals, WNED | WBFO made the strategic decision to merge existing staff from various departments into the newly formed Education and Digital Engagement department. The centerpiece of our digital presence would be the redesigned wned.org. About the same time, PBS Digital announced that they would soon be launching Bento 3.0. As a producing station we had already dipped our toes in the Bento pool using previous versions of the product to design websites for our national productions including The War of 1812 and Frederick Law Olmsted: Designing America on pbs.org. We found it to be a cost effective solution that allowed us to build a web presence for our national productions spending precious production funds on content creation instead of website development and technical needs. We were also using NPR’s Core Publisher CMS for a separate WBFO website. Designed specifically for NPR stations, it was meeting our needs for our news content and was user-friendly. We needed to be able to easily integrate some of the content to build a presence for the station on our main site. Bento 3.0 promised to be an intuitive, easy to use CMS with a “drag and drop” layout-based admin that would allow our web team to focus on content and increasing engagement. It also promised enhanced integration with other content partners and data resources including NPR, PMP and PBS digital products like Core Data Model, Curate and Media Manager. Our 5-year old website was good but we knew it could be better, especially for mobile users. Responsive design and the desire to feature more public media content from PBS and NPR were the driving forces that led us to Bento 3.0. We also wanted to transform the site from a mostly promotional and information platform to become a true content channel that would encourage digital engagement. We were fortunate to be a part of the Bento 3.0 beta group, and the work began well before we gained access to the platform last December. Those weeks of planning became the foundation of our site. What were the keys to our website redesign planning? Evaluate your current site: what works, what doesn’t, what needs to be refreshed, what needs to be added and what needs to be left behind? Collaborate- Involve everyone at your station. Our planning began with a brainstorming session with each department. We reviewed content and made plans for migration, looked at other websites for inspiration, created a wish list and listened to their needs. Each department was asked to appoint a web liaison to help with migration and creating new content. We met again in small groups to review the new design before launch. Strategize- The first month of the beta group was dedicated to digital strategy. The SPI team provided some great worksheets, information and one-on-one calls. They are a great station resource. Actively building a website while the product is still being built was challenging at times but the tradeoff was well worth it as we had the opportunity to provide direct feedback to Project Manager Jen Hinders and the development team. As a joint licensee, we were excited to hear that Jen has been meeting with NPR Digital exploring ways to provide more integration between the services. Nonetheless, the current tool set provided everything we needed to create webpages for our radio stations. The integration with Media Manager, COVE, PMP and even YouTube allows us to effectively present content from PBS and NPR alongside our local content helping us fulfill our goal of creating a cohesive home for all our services. Bento 3.0 has been great for what we call “cross pollination.” We want users to be able to discover relevant content from our various services where they land. So for example, on the main landing page for Classical WNED we pull in the latest arts and culture stories from WBFO through an RSS feed and visitors can steam full programs from Great Performances and Live from Lincoln Center. Our Education and Teachers pages features the latest education news. Visitors can explore themed categories in the WBFO section of the site with pages dedicated to our News Desks special series and Great Lakes Today (a regional journalism collaborative). The live editor delivers on the promise of drag and drop and allows you to easily and quickly adjust layout. I love the clean visually dynamic look. The embed component is a powerful tool that displays custom code. We use it to add elements like our listen live radio steams, custom schedule module which integrates schedules for all our stations on our home page and even the PBS supplied UGC modules for Vietnam. We were able to launch the redesigned wned.org as a secure site in March with PBS supplying the SSL certificate. One of the biggest benefits of moving to the Bento platform is having the ongoing development and technical support from PBS. While Bento 3.0 currently offers every tool we needed for our redesign, we look forward to the release of product updates and additional features. With the launch behind us, we are working to further realize our goal of creating an engaging content destination by focusing on the creation of digital first projects for wned.org. 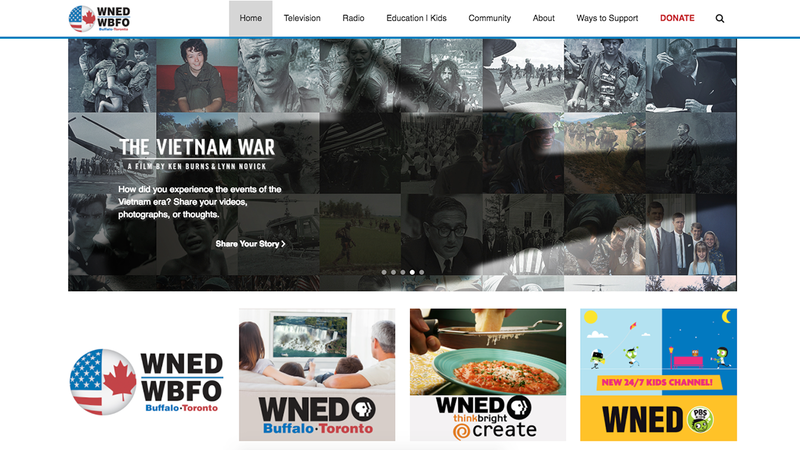 The first of many of these digital first projects, WNED | WBFO‘s Our Vietnam Voices, will be added to the site at the end of August. We will also be making some changes to our WBFO Core Publisher site so the transition between the two appears more seamless to users. WNED-TV is wrapping up production on a program about the opioid epidemic for PBS. We plan to use Bento 3.0 to design the program website on pbs.org. And if the development team is currently working on any new Bento tools that would integrate NPR content WNED | WBFO would be more than happy to volunteer to test them out. To read more about Bento 3.0 and the station experience, head here.